US, 1988, 103 minutes, Colour. Dudley Moore, John Gielgud, Liza Minnelli, Geraldine Fitzgerald. 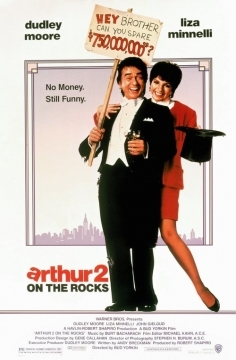 Arthur 2 - On The Rocks, continues in the `spirit' of Arthur, a comedy box-office success of 1981, directed by Steve Gordon (who died not long after). Dudley Moore had a commercial success (different from the many films he appeared in at the time but which were not so successful). Liza Minnelli was an engaging heroine, John Gielgud won an Oscar for Best Supporting Actor as the butler - and here has a reappearance scene as a ghost. The new film was not well-received. However, it follows along the lines of the original, except that it has a reversal of roles with Arthur losing all his money and having to find a job. He and his wife also want to adopt a child - which means then that the film moralises about drinking and Arthur has to reform. Paul Benedict is amusing as John Gielgud's butler successor. Geraldine Fitzgerald reappears once more as Martha. The film is directed by veteran director of comedies Bud Yorkin. 1. An enjoyable sequel? The film in its own right? Characters, comedy, drinking? The play on words in the title? 2. The atmosphere of New York City, the streets, homes, rich and poor? Musical score and the final song (Chris de Burgh and Burt Bacharach and Carol Bayer Sager)? 3. Dudley Moore as Arthur, character, wealthy, spoilt, a drunk? The credits and his joking with the passenger in the car? Going home, his new butler - lacking a sense of humour? His talks with Martha? The money deals and his losing $750,000,000? Meeting Linda, their being together, in love with each other? Being poor, having to get a job, the search? The interviews and Arthur cracking jokes? The work in the hardware store and making a mess of it, the washing of the windscreens? Johnson and the plan for him to get married, his friendship with Susan, dates and deals? His looking for a place to live with Linda, the comments of the landlord? Linda going back to her father, Arthur searching her out? 4. His decline, seeming hopelessness, drinking? The question of the baby, Mrs Candy and her interviews, the motivation for work? 5. Down and out, the appearance of Hobson, their walking together, others not seeing him and him talking to the air? The police urging him on, walking through the circus, the drifters' refuge? Being told off by Hobson - and that everything depended on him? 6. His decision to change, the encounter with Martha, the visit to her, the documents, meeting Susan, the boat, the confrontation with Johnson, the fight, his freedom? 7. Linda as attractive, love for Arthur, poor, her work, clash with Susan, the apartment, going back to her father, wanting to have the baby, interviews with Mrs Candy, the reconciliation, the arrival of the baby, her pregnancy? 8. Susan and her wealth, attracted towards Arthur, the arranged marriage? Bert Johnson, wealthy, crooked, Arthur confronting him and his friends, the deals? Susan dominating him and separating happily from Arthur? 9. Martha, her wealth, concern about Arthur, her exercise man? Giving Arthur the documents? 10. The substitute butler, his seriousness, Arthur's practical jokes, his not getting them? The end, Arthur and Linda returning, his squirting Arthur with the flower? Going into Hobson's room? 11. Hobson and the memories from the first film, his appearance, his warning of Arthur, helping Arthur to see what had happened? 12. The jokes about drinking, the jokes about riches to rags and rags to riches, reform, children and responsibility? The happy ending?